There are lots of food blogs out there. It’s impossible to follow every one. Clearly, I’m missing out on some good stuff. Thankfully, the blogs I read help me to find some of that good stuff that’s on other sites. So I’m giving Alice @ Savory Sweet Life a big BAH thanks for her post of Jaden’s Coconut Shrimp. Otherwise, this gem would have gone unnoticed by me. And as #4 states, that is not a good thing. 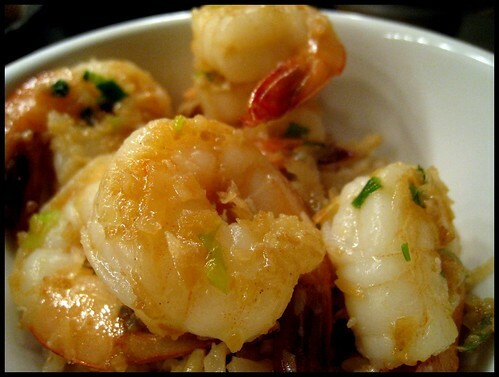 BAH Tip: If using smaller shrimp, work in batches so that they do not steam. You want them to cook quickly in the pan so it’s important that you only have a single layer of shrimp in the pan at a time. Pat shrimp dry with paper towels and set aside. Place a large frying pan over medium heat and add the coconut. Stir occasionally and toast until golden brown. Transfer coconut to a plate. Return empty frying pan to stove and set over high heat. The pan is ready when a bead of water sizzles on contact and evaporates. Add oil and shrimp to the pan. Cook for one minute then turn and cook for one minute on the other side. Remove shrimp from the pan, leaving as much oil in it as possible. Reduce heat to medium and add butter to the pan. Once it has melted and starts foaming, add the green onion and garlic. Cook until fragrant, approximately 30 seconds. Remove frying pan from the stove and add the cognac, a pinch of salt, and sugar (if using). Return pan to the stove and stir to combine. Return shrimp to the pan and let the sauce thicken slightly and coat the shrimp. Remove from heat, add the toasted coconut, and gently toss to combine. Serve as an appetizer or add rice for an entree. The shrimp look great…nice photo, Wendi! Thanks Tracy. I’m tempted to suggest you and I make a trade – I’ll make you some of Jaden’s shrimp in exchange for the pancakes you posted. I don’t know if you’ve looked at the Splurge Post, but I think of you when I make that pasta. Kay, dumb question here–sweetened coconut or unsweetened coconut? I was tempted to say there are no dumb questions…but hello, hells yes there are. This however, is not a dumb question. I happened to have sweetened coconut in my freezer so that’s what I used. Just note that if you’re using sweetened coconut, omit the 3/4 teaspoon sugar…maybe I’ll go back and give that footnote a little italics or bold so it doesn’t get lost. Wendi, I was salivating over the Splurge Post. One of these days you and the Mistah will have to come to Highlandtown for a nice Italian feast. Tracy, we don’t eat a lot of pasta (thanks South Beach!) that’s one reason I made such a big fuss over that recipe. I will eat salad for lunch all week if it means that I can have this for dinner occasionally. Actually, we had it Monday night when my originally planned dinner didn’t quite come together and I had leftovers of it for lunch today. Between that and those flourless peanut butter cookies you posted, it’s been a tasty week. This looks so good. Why didn’t I buy more shrimp when they were half off at Whole Foods! Beth, you’ve got the upright freezer. You should absolutely have some shrimp in there. Seriously! I have to look at these before breakfast! Now, I will have these gems on the brain all day…thank goodness it’s shopping day! !